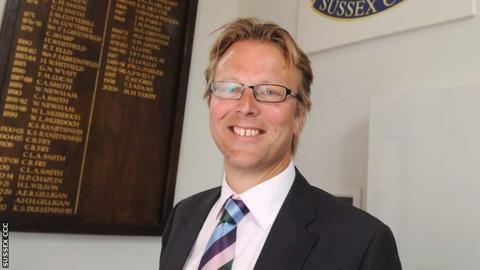 Outgoing Sussex chief executive Dave Brooks says he is proud of what he has achieved during his time with the club. Brooks, who will step down at the end of the year, oversaw the redevelopment of the Hove County Ground. He told BBC Sussex: "Every day when I walk in to the ground and see the new stand in front of me I still get a huge sense of pride. "Hopefully that legacy will last for many years as something we achieved as a team under my tenure." He added: "I'm proud of all we've achieved as a team and a club; with the ground development work that's gone on, the work growing in our commercial profile and commercial income and integrating the recreational and professional games. "Luckily I've been in an environment with really good people around me. When you have that, it's much easier to do a good job." Brooks, who joined the club in 2009, believes the end of this season was a good time for someone else to take charge at the county. "You just know sometimes, deep down, it's the right time," he continued. "I feel it's now time to pass the baton on to someone to take the club and the sport in the county on to the next level. "We've got three days of Australia [playing] at Hove in 2013. "Commercially, it'll be easier than other years and it's a really good opportunity for someone to bed themselves in and be ready for what will be a much tougher 2014. "We'll make sure there's a good orderly handover of the club and we've still got momentum. "I feel I've done my bit and it's time for the next person."